Hi All! Hope everyone is doing well. I hope you all have been visiting Modern Sugar Blvd. They've got some really great digi-images and we all know what wonderful, instant gratification digi-images are and if you don't - you really should try them out. MSB announced Saturday a new challenge that I posted on Saturday, too. But just yesterday they posted a Create-A-Card contest and get this... there are two winners that will win an entire collection of digi-stamps! And I am so excited that our lovely Sugar Mommas are letting the DT members try for it, too. So here's my card! I love this card! The dp is digi-paper from Gina K, love it! So my style. 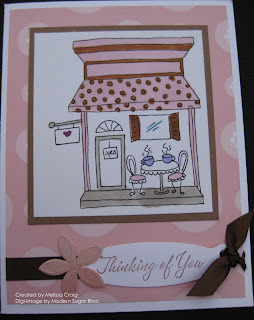 The sentiment is from a wonderful and retired set from Stampin' Up!. Ribbon, of course, and I used my new Nestibilities dies for ribbon tags. I also added these great flowers that I picked up in the bridal section at Michaels. They come in lots of great colors, but why do all that. Buy white and/or ivory and using your Prismacolor or Copic markers - color them to coordinate with your card! I added a bit of stickles in the center of the flower but it isn't visible in the picture. The image is from the Around The Town collection - this is the coffee shop.